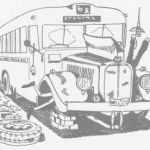 ATDB • View topic - Denning buses and coaches:a history in photos.Part 1. Re: Denning buses and coaches:a history in photos.Part 1. Here's an image of one of Fellowes Denning Denairs on display at the bus show. Somewhere in my slide collection waiting to be looked at I'm fairly certain I have a few shots of the one off Denning in question on display at the bus show. No promises but I'll see what I can find. While on Denning, here's an advertisement by Pickles for their auction of the Deluxe fleet of over 100 vehicles. I haven't recorded the date/year, someone may be able to confirm that. Advertisement for the Pickles auction of the Deluxe fleet. Thank you Centralian for your reply and photos. The Denning of Fellowes shows how similar the concept coach was to those Dennings.I know they had a later model Denning with centre door. I was working for Deluxe in 1989.They were shut down that year.The fleet would have been up for auction later that year or into 1990. Deluxe went belly up in 1990, 25th September was a Tuesday that year. 115 coaches must have pretty much been the entire fleet. Thanks for adding the photos Bedford-29.Great collection.I like the Denair TV599. Those centre doors make a difference. Never seen a centre door in a Denair before. Hi all, we are proud owners of a Denning Coach, (No 712), late of Tasmania,then Kunanurra WA, and now Darwin, for a fit out to Motor Home, here a couple of pics as i drove her home. Any updates on this resto project. '96 MAN Austral Denning Starliner, model 14.190 HOCLH, with "school" accessories. Originally in service with Westernport Road Lines as NXX656, still in daily service with Sydney Boys High School. I know very little about Aussie coaches, but i have to confess that the Denair is just beautiful. What kind of chassis usually equipped these bodies? There was no chassis as such. The predecessor to the Denair was the Mono, standing for Monocoque, meaning mono constructed or integral. Usually fitted with a Detroit Diesel engine, Fuller or Spicer gearbox, Eaton or Rockwell Diff with either Eaton or Rockwell brakes. Here are some of my Denning coaches photos taken at various Tasmanian locations. I may have already posted one or 2 elsewhere.